SJ: I find it interesting that non-Mormons were on the Council – can you tell us more about why and what their roles were? JSR: We know very little about the three non-Mormons admitted to the council. It's safe to assume they were friends of Smith, but the details of their lives escape us. They each had a brief stint in the council and were summarily dropped by Young when he reconvened the council in early 1845. For these reasons, I think it's easy to overplay this idea, especially when we consider that council gatherings sometimes mirrored church meetings, complete with prayer, song, and scripture. Early members emphasized that the council was distinct from the church—"a nucleus of popular government," to quote again from Johnson—but the distinction seems largely to have been academic, since believers populated both arenas. Smith seemed to have constituted the body as a dim reflection of political plurality. What his larger vision was of folks outside the church is simply not clear from the available record. SJ: I understand Brigham Young and John Taylor were crowned as Kings of the World – were these designations symbolic, or did the Council of Fifty literally think of them as Kings? JSR: Both. The designations certainly held symbolic significance, and poignantly so when you consider the circumstances of the crownings (Young leading his people into the "wilderness" as a Moses-like figure, Taylor fleeing into hiding). But the act of anointing kings was real, too. Not as an Old World monarch but as God's chosen political designee responsible for handing down divine decrees. Taylor even acted the part, purportedly receiving and recording "revelations" that directed the council and the church generally, which are highlighted in the book. Moreover, council members believed in a literal sense that "the Kingdom is now being established," in the words of Joseph Fielding, and that "the millennium had commenced," as Young put it. SJ: Who were some of the more interesting members of the Council that some might not readily recognize by name? JSR: This is a hard question to answer, since although scores of men sat on the council, many of them said next to nothing about it. While we have records of some of their deliberations, conversations were primarily monopolized by the "leading" men, most of whom are familiar to students of Mormon history. That said, we are introduced to men like George Miller, James Emmett, Peter Hawes, and a few others who ended up not migrating to the Salt Lake Valley. We have quite a bit on folks like Albert Carrington, David Fullmer, Daniel Spencer, and a handful of others who frequently served on council-designated committee assignments. Readers, I think, will find some characters more savory than others. Orson Hyde comes across as disagreeable, Franklin D. Richards, quite likable, at least from my perspective. I hope for folks reading this cover to cover they get a sense of a collective biography of an interesting mix of men. 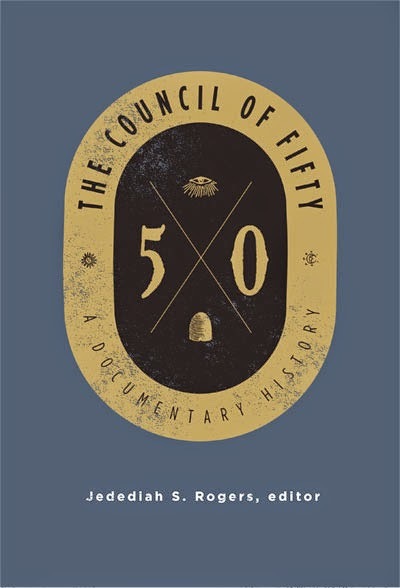 SJ: What, if anything, are you hoping will be learned about the Council of Fifty once the contents of the Nauvoo minutes are released by Church History Department in a few years? JSR: What will the official Nauvoo minutes, currently unavailable for public consumption, add to this story? Along with many others I look forward to seeing for myself. For the most part I believe the JSP editors working on the Nauvoo minutes when they tell us that the record will add to and enhance the existing sources but not undo what we already know. I think there will be some surprises, though. I suppose I'm most curious about what the minutes say about expanding and/or relocating Mormon settlement in Texas, Oregon, and "Upper California." Did Young intend to establish a Mormon "state" outside the jurisdiction of the United States? I don't think we have good evidence supporting this theory. Certainly, the Mormons settled in what was Mexican territory and looked forward to theocratic rule, where God's laws would not be impinged. And they hoped for a homeland where they would have "room to expand." While some Mormons unleashed anti-American rhetoric, they generally spoke of love of country and its founding principles. Even before the Great Basin became United State territory, Young and many of his associates probably anticipated that it would eventually become so, and they sought to curry favor from federal officials, even informing President Polk in 1846 of plans to carve a state out of Upper California. Statehood would create "home-rule" within the American political system, even though it threatened to temper theocratic designs. So the evidence points in both directions. It's possible that the Nauvoo minutes will illuminate this question. SJ: Did the Council of Fifty carry out capital punishment / blood atonement? JSR: Not that we have evidence for. But we need to acknowledge the legacy of the council in the sordid affair of "blood atonement" and frontier violence. Here we have a body of leading men serving as legislative and judicial authorities who acted in confidence and discussed retribution of those who violated the council's confidentiality and of transgressors, both within and without the council. Upon entering the Great Basin, inhabiting a pristine wilderness untainted by corruption, Mormons seemed to want to forge a new land and new people, purged of vice and wickedness. Young believed that such a society might exist only with an iron fist, preventing "infernals, thieves, Murders, Whoremongers & every other wicked curse to [exist]." Young took this idea, he says, from the very name of the council, as dictated by revelation: "The Kingdom of God & Its Laws and Justice & Judgement in my hands. Signed Ahman Christ." The council considered it their solemn responsibility to carry out the demands of justice. John D. Lee, more than other diarists, seemed to be particularly interested in Young's rhetoric of violence. Much of the disturbing stuff Young says comes to us from him. Which raises the question, is Lee reporting what went on accurately, or is he projecting some of his own tendencies and opinions onto the words of others? One of the benefits of having a collection documents of this is that it allows you to compare entries by various authors. We see how men differ in the ways they filter what transpired in council meetings and how they chose to record it. SJ: Should I expect to be blood atoned for asking these questions and posting them on MMM? JSR: Just be sure to spell certain keywords SDRAWKCAB to avoid detection. Because, you know, YTFIF is a hard one to crack!